I don’t need much of an excuse to reenact my childhood adventures, as I see it, a way of keeping my young. 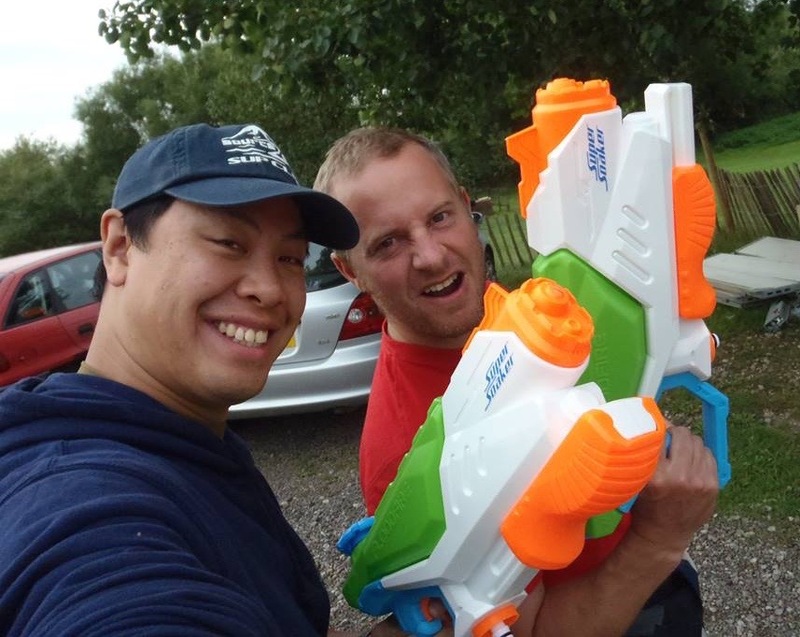 When I heard about a big water fight that was being held at the Avon Valley Adventure and Wildlife Park where I’m based, it sounded like too much fun to miss out on. And especially as I had managed to get a baby sitter arranged to look after the kids whilst the adult water fight took place! I went online and ordered three Floodfire Super soakers for the event, one for me, one for my lovely wife Vicky, and one for Simon my business partner in Battle Archery. 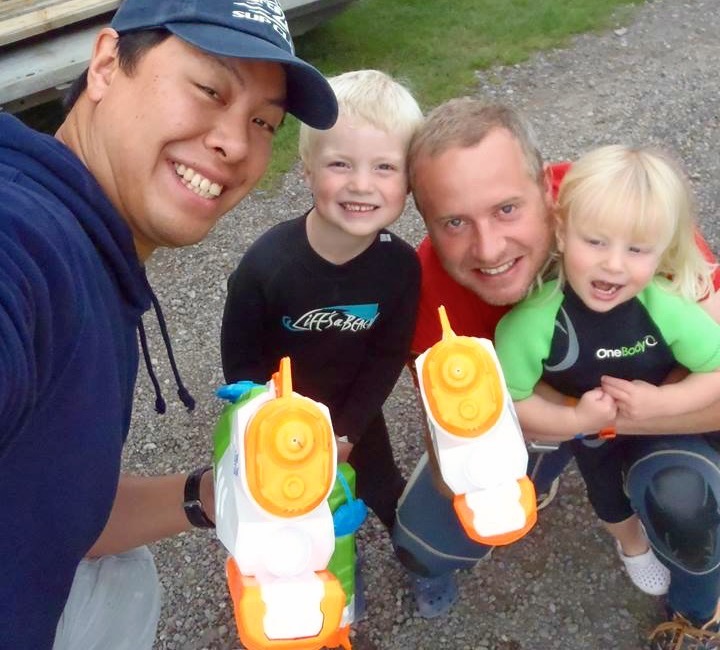 On the evening of the water fight we put the kids in their wetsuits to give them a little more staying power. I wasn’t sure if my five year old son would be able to carry a Floodfire full of water, but I gave it to him anyway for the kids’ game. A spray of water down the back of my neck was proof he had no problem firing the water out of it! The water fights were organised by the Super Pirates. The children-only waterfights were up first, followed by the family game, then finishing with the adults. The kids gathered ready to get wet with more coming from every direction, and the anticipation was really growing. Suddenly the count down was on and before we knew it kids were going crazy! Water was going everywhere, and my kids were loving it. I got as much a soaking as they as I had to help my two year old daughter around and squirt a few people. I would have loved a water fight of that scale when I was a kid!! 2,000 or more water bombs later the children’s water fight was over and time to get ready for the family one. Both kids laughing and giggling with their friends, soaking wet and smiling from ear to ear. We missed the family game as we headed for the water slide set up just a little further down the park, and as a family enjoyed a slide on our fronts. Great fun! It was time for the adult water fight and with Simon ready to go with go pro primed and Vicky aiming at me with a glint in her eye, we counted down. As soon as it kicked off water fired in from every angle and I decided to just squirt anything that moved. I managed to get both Simon and Vicky pretty much as much as they were getting me, and we soon started spreading out and going in for attacks on pockets of people. Lots of laughing, screaming and general childish behavior, it was brilliant! I had to refill a few times and even found the last stash of water bombs which didn’t last long at all. I suddenly noticed a bag of flour go whizzing past and thought I’d better get running, but unfortunately for Simon who had just picked up a full bag of it, and decided not to get me, got a face full himself. I found it hard to talk from laughing so hard, but quickly came to his aid and squirted water in his face to help him get it off. I was lucky and avoided the flour bombs, but many didn’t and by the end there were a few bedraggled looking zombies walking around. Soaking wet and smiling almost as much as the kids, we headed off to change. With a stunning sunset in the distance we jumped in to the river to water off and enjoy the moment. Great end to a great event! Fancy grabbing yourself a Nerf Flood Fire? Check out the link!